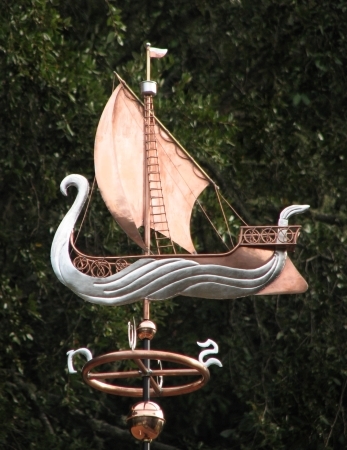 This elegant Elven Ship Weathervane was designed to be mounted on a newly constructed home at the California seashore. 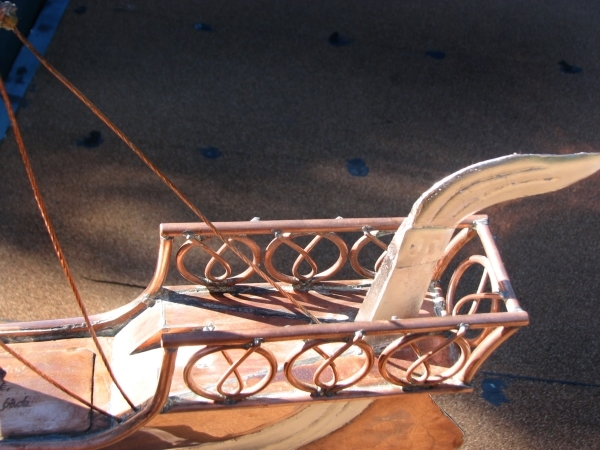 Like so many of us, these customers had been touched deeply by JRR Tolkien’s Lord Of The Rings. 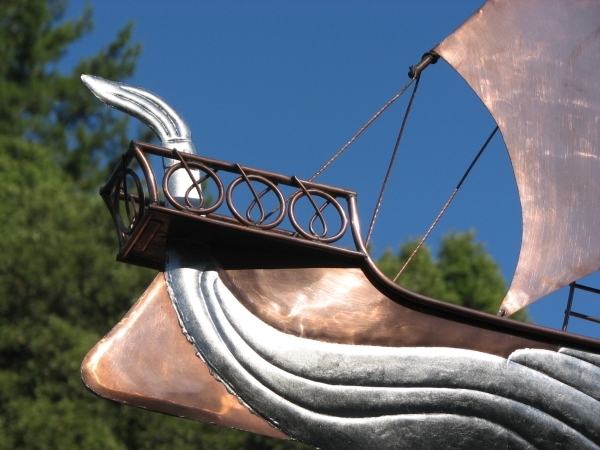 They chose to design their home with the feel of an Elven Hall, and they named their home Grey Havens, also known as Mithlond. 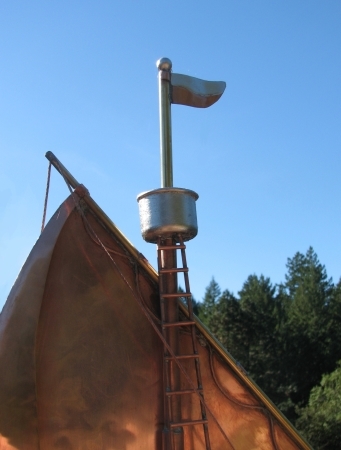 The ship sculpture piece is fabricated of copper, in the swell bodied style. 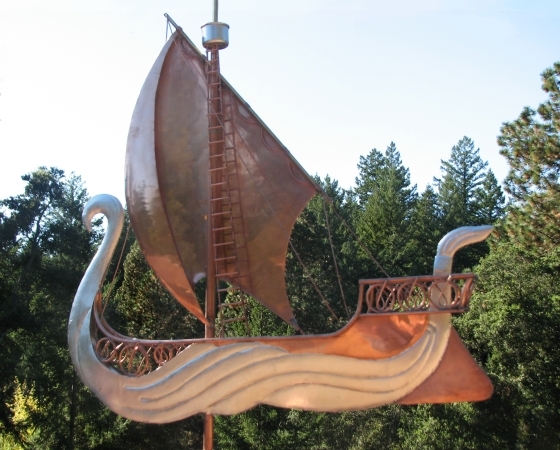 It is designed using an Elven Swan motif, with a railing design that includes representations of the three rings given to the elves by Sauron, the Dark Lord. 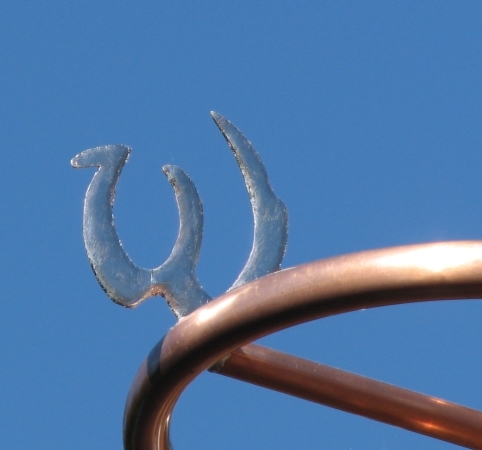 The directionals are also a custom design again utilizing the theme of the ring, and the letters of the directions are in ‘elven’ script. 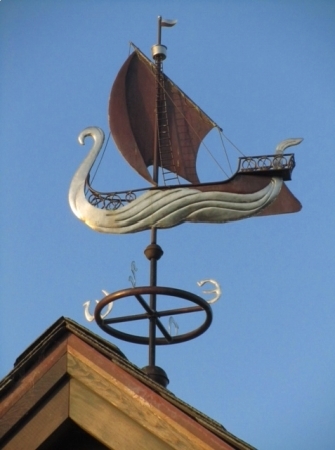 The price for this weathervane includes the “Ring” directionals. 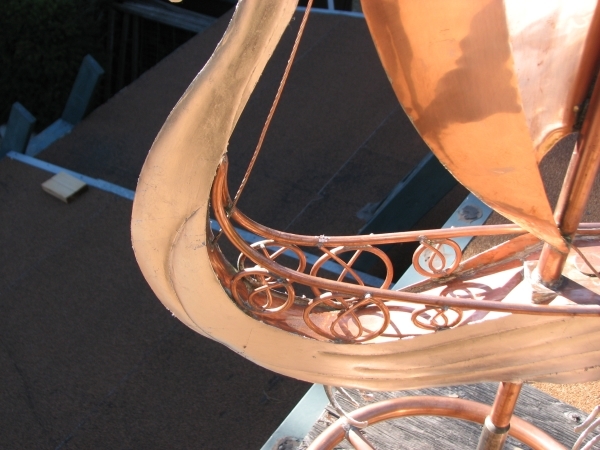 If desired, we can supply standard brass directionals instead, which will have the effect of lowering the price. Please contact us if you are interested in this optoin. 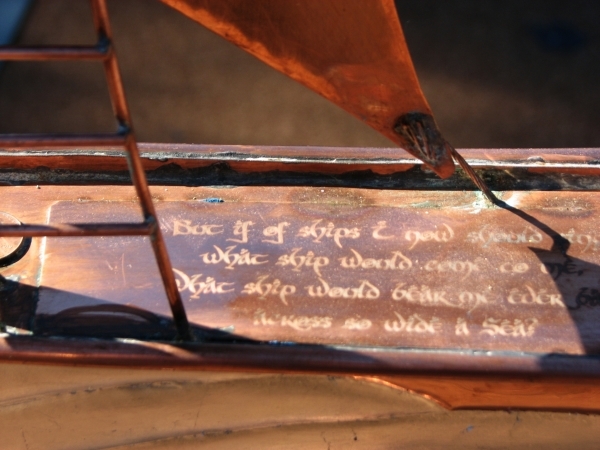 This customer also asked to have a plaque engraved with a favorite Tokien quote executed in this same Elven styled font. Because of space available, a special engraved plaque such as this would only be possible in the large and extra large sizes. 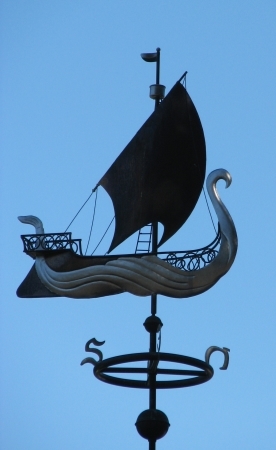 The swan, the crow’s nest at the top of the mast, and the directional letters were leafed with optional palladium leaf, creating a lovely contrast that will remain bright for many years and the copper darkens, and then patinas. 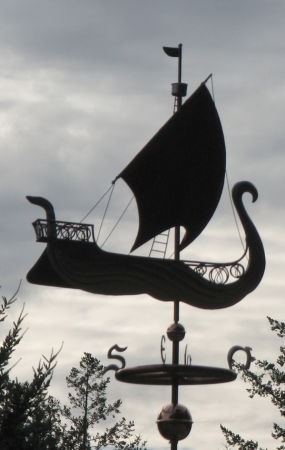 We’ve included a photo of our traditional Swan Weathervane so you can compare it with the stylized swan present in our Elven Ship Weathervane. 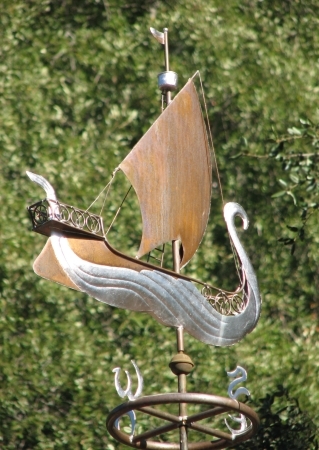 As fans of “The Lord of the Rings” books, if you have an idea for a Tolkien themed weathervane, we would love to hear from you! 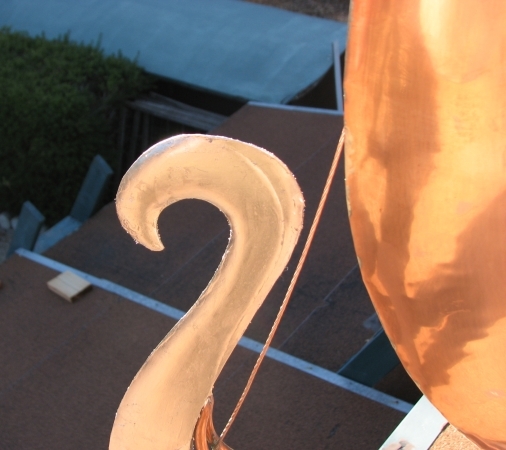 Every weather vane made here at West Coast Weather Vanes is distinct. 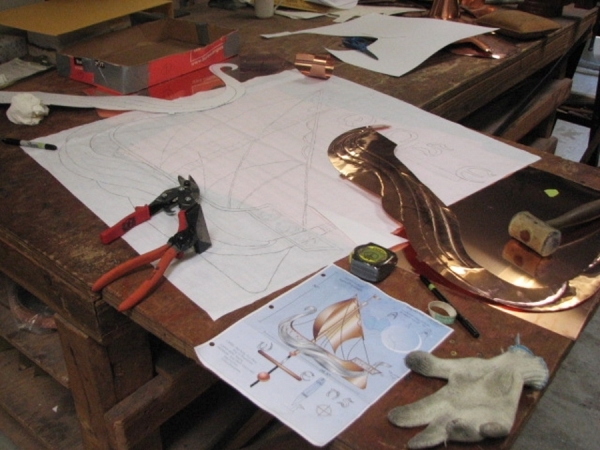 Each is made to order and easily personalized. 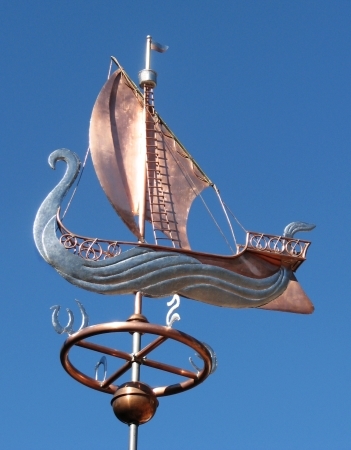 If you have a dream of a weathervane that expresses you best, be it tweaking an existing design or starting from an inspired idea, as we did with this one, please contact us to discuss it. It is what we love to do.